The first project of its kind in Japan, the Miyagi Onagawa Coho Salmon Aquaculture Improvement Project (AIP) is located in Onagawa, a deep water port on the rugged Sanriku Coast of north-central Miyagi Prefecture. At the intersection of major ocean currents, the waters in and around Onagawa are some of the best fishing grounds in Japan. Home to a thriving aquaculture industry including oyster, scallop, and seaweed, Onagawa is also where the first successful commercial coho salmon farming businesses were developed. Marukin Co., Ltd., the owner and operator of a coho salmon farm in Onagawa for over 30 years, had its operations completely destroyed in the March 11, 2011 earthquake and tsunami which devastated the region. Since 2011, regional recovery efforts have led to a revitalized and rebuilt aquaculture industry in Onagawa. Marukin, which has reestablished net cages and resumed salmon farming, now produces roughly 465 mt of coho salmon a year under the brand name “Gin-Ou (Silver King)”. 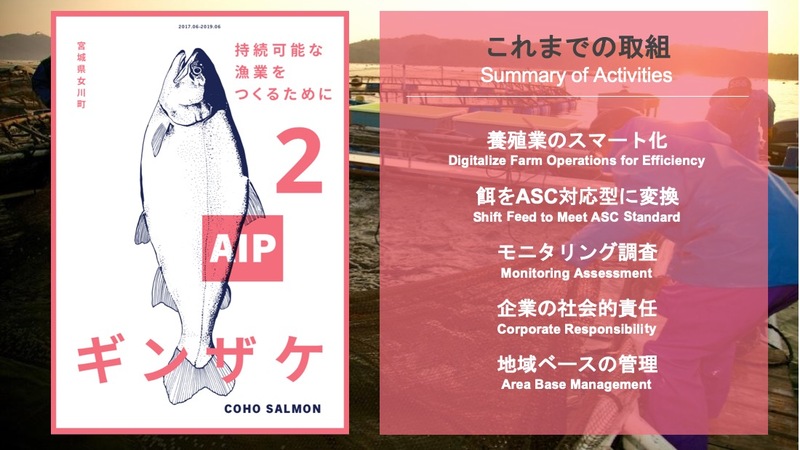 Marukin is participating in the AIP to establish itself as a globally recognized sustainable coho salmon fish farm while revitalizing the regional economy and improving the sustainability of the region’s aquaculture industry. Facilitation of an ASC pre-assessment which identified priority areas for environmental monitoring and opportunities for improvement in aquaculture practices. Development and implementation of an AIP workplan to address deficiencies found during the ASC pre-assessment. These include monitoring the farm’s impacts on surrounding ecosystems, evaluating sustainability of the feed, and developing farm policies relating to social responsibility. Convening project stakeholders to generate support, participation, and attention for sustainable seafood and aquaculture improvement efforts in the Onagawa region. Volume: ~465 mt - The farm reports annual production of about 130,000 coho salmon, or roughly 465 mt assuming each fish weighs about 3.6 kg (3.6 kg estimate taken from NOAA).